WARSAW, Poland (AP) — U.S. Vice President Mike Pence paid homage Thursday to the suffering of the Jewish and Polish people under German occupation during World War II with visits to memorials honoring their suffering and heroism. The heavily symbolic visits to a city destroyed by Adolf Hitler's forces were gestures of friendship to two of America's closest allies, Israel and Poland. They came a day before Pence will make his first visit to Auschwitz, the memorial site where Nazi German forces killed 1.1 million people, most of them Jews, in what was then occupied Poland. Pence first joined prime ministers Benjamin Netanyahu of Israel and Mateusz Morawiecki of Poland in honoring the wartime Jewish insurgents who rose up against Nazi German forces in the Warsaw Ghetto uprising of 1943. Joined by their wives, the three took part in a wreath-laying ceremony at the Warsaw Ghetto Uprising memorial. A cantor recited a prayer in Hebrew as the three couples faced the dark memorial, with representatives of Poland's small surviving Jewish community in attendance. Pence and Netanyahu then held talks in the POLIN Museum of the History of Polish Jews, located on the same square in the heart of the former ghetto, which tells the story of 1,000 years of Jewish life in Polish lands. Netanyahu wrote in a museum guest book: "May the spirit and heroism of the Warsaw Ghetto Jewish resistance fighters who staged the first organized uprising against Nazi occupation in all of occupied Europe be an eternal reminder of the dangers of powerlessness in the face of tyranny." In remarks in front of journalists ahead of the meeting, Pence, a conservative Christian, told Netanyahu that it was "very humbling for me to be here with you in this very special place on this sacred ground. To hear a prayer sung, and to remember the heroes of the Warsaw Ghetto." The revolt ended in death for most of the fighters, yet left behind an enduring symbol of resistance. Netanyahu said their resistance saved the honor of the Jewish people. 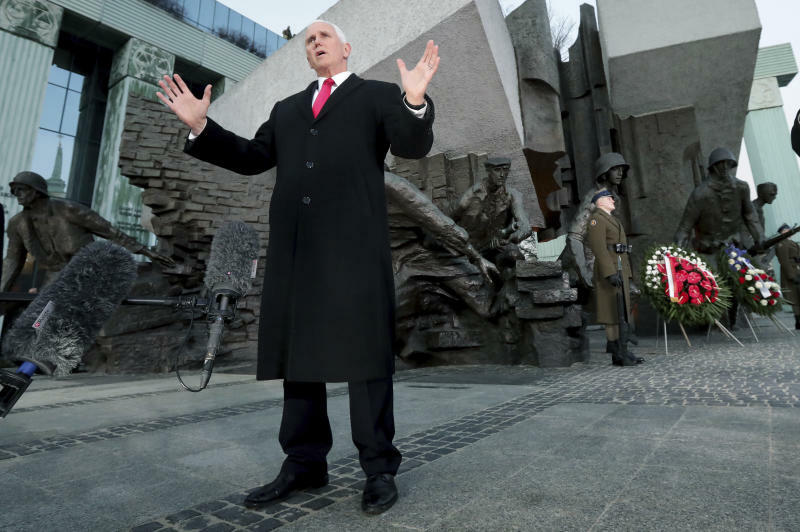 Pence was later accompanied by Morawiecki to visit a memorial to the 1944 Warsaw Uprising, an important site for Poles where President Donald Trump gave a speech in 2017. In that revolt, Polish insurgents took up arms against the powerful German forces, holding out for 63 days before the Germans crushed it. In retaliation, the Germans murdered some 200,000 Poles and razed Warsaw to the ground. 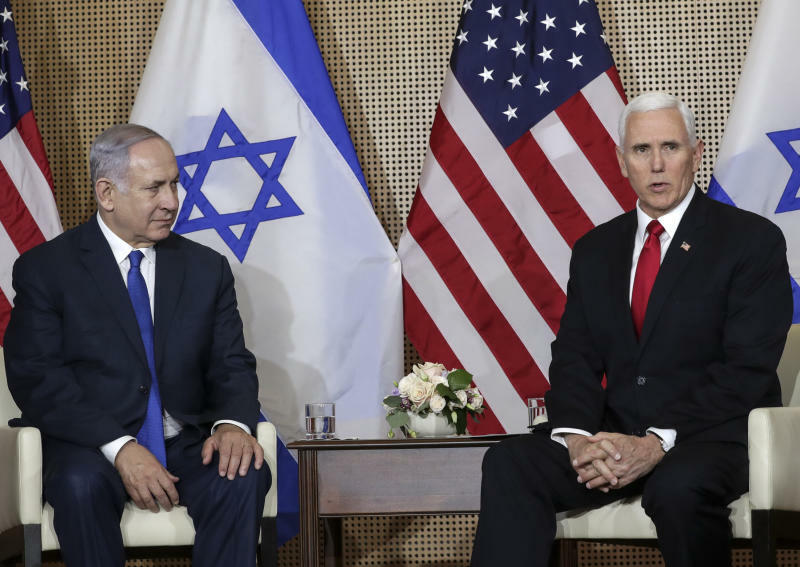 Pence and Netanyahu were in Warsaw for a conference on the Middle East co-hosted by the U.S. and Poland that was devoted heavily to isolating Iran. In a speech to the conference earlier Thursday, Pence drew a line from the war that began 80 years ago to the Middle East of today, saying "the Iranian regime openly advocates another Holocaust." The Polish and Israeli nations have built their modern identities on the lessons of World War II, and the respective uprisings remain to this day sources of pride and honor. Veteran NBC journalist Andrea Mitchell learned that lesson after she said during a live Wednesday evening report from Warsaw that Jews in the ghetto rose up against the "Polish and Nazi regime." The Polish Embassy in Washington called the conflating of occupied Poland with the occupying German Nazis "a serious distortion of history" and said MSNBC should clarify the historical facts. Late Thursday, Mitchell issued an apology on Twitter. "I misspoke on the show yesterday when I discussed the 1943 Warsaw Ghetto Uprising. To be clear, the Polish government was not involved in these horrific acts. I apologize for the unfortunate inaccuracy," she wrote. 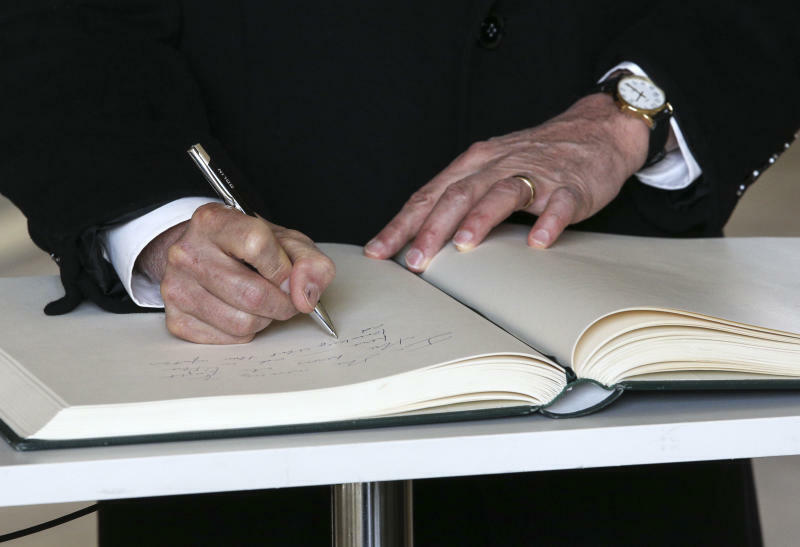 This story has been corrected to say that the comments left in the guest book were by Netanyahu, not Pence.